Friday night, in one of the most exciting basketball games I’ve ever sat through, #12 SFA squeaked a win over #5 VCU. In the last 3.6 seconds of a tight game, with SFA only four points down, Desmond Haymon hit a three-point bucket–and one of the Rams hit him. Haymon scored from the line, and next thing you know, we have a tied game. SFA Lumberjacks fought their way to a 77-75 win, and I just ’bout yelled myself hoarse. To my inexperienced eye, the teams were evenly matched. Still, the thought that SFA was the underdog always niggled in the back of my mind. At one point, SFA had a 10 point lead, but VCU effectively shut it down, caught up, and passed us, and I thought the game was over. They got a good lead over us. But we changed our game, made a few adjustments. Soon, we shut them down, caught up, and ended regulation time with the miracle four points that put us into OT. 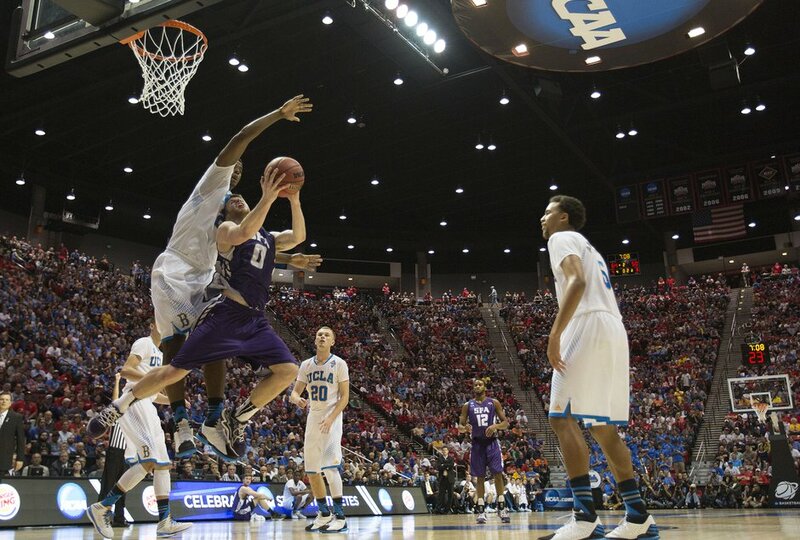 The win against VCU pitted us against UCLA, probably the king of the NCAA basketball play-off tournaments. They’ve made it to the play-offs over a hundred times. SFA? Uh–no, nowhere near as often. The Bruins are tall. The Jacks aren’t. Uh-oh. We had a rough go against UCLA. Couldn’t slap a shot into the net because some giant of a guy was always there to block it. Couldn’t always make the three-pointers because those aren’t easy to begin with. The refs’ whistles blew every other second, and it seemed like the foul call was always against us. That left me yelling at the TV screen on a regular basis. At one point, the guys seemed like they were all five feet apart, yet the ref still blew his whistle. I shot my hands in the air and hollered What?! Aw, c’mon! so loud the cats ran for cover. The Bruins–and the refs–wrecked our 29-game winning streak. 1. You’re always going to be better than some and worse than others. You’re always going to be more successful than some and less than others. Don’t worry about that. Play your game. Unlike the teams in the play-offs, this isn’t a competition, even though the publishing industry is one of the most competitive businesses out there. We play against ourselves, just us and the goal. Keep shooting for the goal. 2. If you’re not making your publication goal, maybe it’s time to adjust your game. Evaluate what’s going on based on what feedback you can garner. A coach watches the action and usually has a staff of coaches to confer with. Do the same–find some reliable, knowledgeable critique partners to help you see the action. Could be your query letter, long or short blurbs, synopsis that aren’t scoring for you. Could be you have to change your game plan. Be willing to do it. 3. If this manuscript doesn’t work, go write another one. There’s always “next time.” The fact that you’ve finished a manuscript is a major accomplishment to begin with, but that doesn’t mean it’s the only book idea you have in you. If your goal is a contract with one of the major publishers, try again. You’ll get there. Keep your head in the game, keep trying, keep aiming at your goals. The idea of Cinderella didn’t originate in sports–it came from a writer. Go write. This entry was posted in Writing, Writing Tips and tagged 2014 March Madness, Basketball, NCAA, publishing, SFA, SFASU, UCLA, VCU, write tips, Writing. Bookmark the permalink. Great thoughts! I particularly resonate with #1. That’s something I’ve been pondering here of late. It’s both exciting and humbling – and both of those are good things. I’ve been so proud of you and your rise to success. And I can’t wait for your next book! Oh, good! That’s what I was aiming for! Glad you liked it, Sweet Lynn! That’s what most say, to be successful – write. To be a winner – write. Study more on the craft and write. Great advice as always, Linda! I don’t write often enough. I need to get back into working on more than just my WIP.